Over three weekends Nuns Moor Park has welcomed a new lease of life. Starting on the 20th November a team of enthusiastic volunteers worked hard clearing leaves, picking up litter and digging over flower beds. 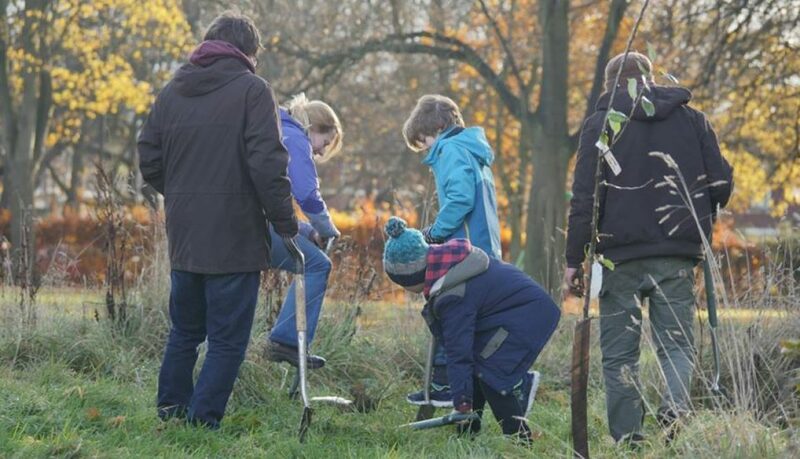 This was followed by tree planting sessions throughout the park, fruit bushes planted at the Bike Garden and bulbs planted at the entrance to the park. Over 60 volunteers attended the three events providing a whopping 225 hours of volunteer time! The trees, of all varieties and sizes, were planted in conjunction with the Big Tree Plant and 100 Trees. Alongside native woodland species that will be enjoyed by generations we planted fruit and decorative trees throughout the park. These trees will not only look great in the spring and summer months but will attract more wildlife into the local area. It is clear, from the sessions, just how important Nuns Moor Park is for local people. The park is used daily for dog walking, keeping fit, getting some fresh aid, playing games and enjoying picnics. It is a vital green space that needs managed, looked after so it can be enjoyed for years to come. If you are passionate about the park and want to make a difference we would like to hear from you. The Friends of Group will be holding monthly sessions in the New Year. Everyone is welcome to attend as we have loads of different tasks. Finally … We have spare trees! If you would like a small tree for your garden please contact the project; we can advise which tree will be suited to your chosen site.